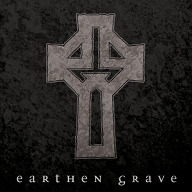 Review: "Earthen Grave: Earthen Grave" - Sea of Tranquility - The Web Destination for Progressive Music! From Chicago comes Earthen Grave, a unique 6 piece doom/classic metal band comprised of guitarist Jason Muxlow (The Living Fields, Wintering), drummer Scott Davidson (ex-Stonehenge, owner of Rebel Radio), bassist Ron Holzner (formerly of Trouble, Debris Inc., Place of Skulls, etc. ), vocalist Mark Weiner (Trifog), guitarist Tony Spillman (Spillage), and classical violinist Rachel Barton Pine (extended range electric flying V violin). Yes, you read that right, a violin player in a doom metal band. Earthen Grave are unlike anything you have heard in recent memory, as they take the Black Sabbath/Pentagram/Witchfinder General formula to another level by adding in Pine's lovely violin work, which gives these crushing songs an almost Kansas-ish feel to them in spots. Just listen to the dueling guitar & violin on "Life Carried On" to see just where these guys are coming from. Exciting stuff for sure. The title track is a like a head on collision between Sabbath and Soundgarden, complete with Weiner's Chris Cornell influenced vocals, and the heavy cover of Witchfinder General's "Burning a Sinner" is quite successful. Plenty of classic rock elements on the moody "Blood Drunk", including some great chugging guitar riffs, and "Dismal Times" slows down to a plodding crawl thanks to some monstrous guitar dirges, but made all the more effective with some poweful vocals and soaring violin. "Beneath a Shovel Load" starts off with a slow build and eventually morphs into a beefy & bluesy doom classic that will make any fan of Pentagram happy. Speaking of the Virginia legends, there's a great cover of their classic tune "Relentless", with Weiner doing his best Bobby Liebling impression. There are also two strong, epic length tracks near the back end of the CD, "Fall In" and " Death on the High Seas", each one full of dramatic, heavy riffs, engaging musical passages, sizzling violin, and great vocals. This one came as a big surprise, and after hearing this debut album I'm going to be keeping a close eye on Earthen Grave in the near future.